God tells us in Numbers 20 that Aaron was ‘gathered to his people”. I like that. It makes great sense when someone is a believer. His people are in heaven. His Father is in heaven. And his Savior is in heaven. So – where are my people? God has blessed me by giving me a family with a very long lineage of Christ-followers. Many generations of my people are in heaven. The people I identify with here on earth are also Christ-followers. These are my people. 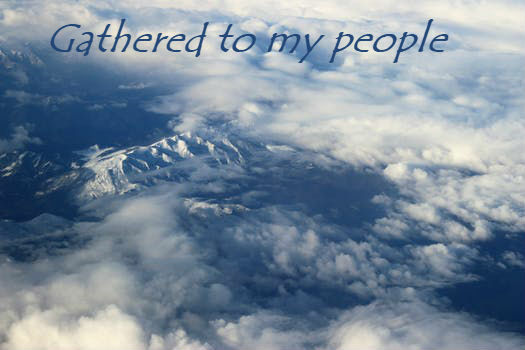 They will be with me when I am gathered to my Father – when I am gathered to my people. I’m tempted to start using that phrase with believers instead of ‘died’ or ‘passed away’. Some people wouldn’t get it but that’s ok – some people don’t get a lot of things. How about you? Are your people in heaven? Is your Savior in Heaven? If so, then he has prepared a place for you. Will you be with me when all believers are gathered to our Father in Heaven? I hope and pray that you will. Thank you for always keeping your promises, Abba Father.